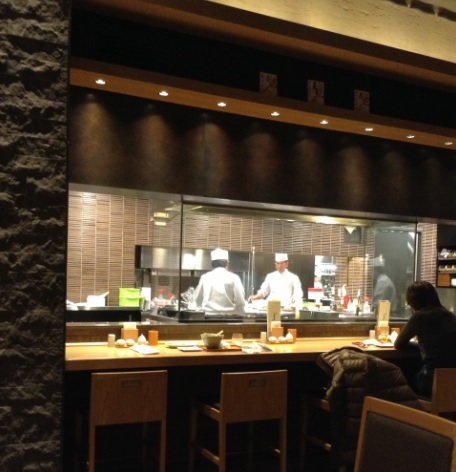 I went eating at Umaya (Addr: 〒160-0013 Tokyo, Shinjuku, 霞ヶ丘町14−1 2F – URL http://www.jrfs.co.jp/umaya/restaurant2s/shinjuku, Facebook: https://www.facebook.com/akasakaumaya.shinjuku?fref=ts ) for their Kagoshima pork shabu shabu. The restaurant is new (opened in August), and clean. The service was impeccable during my visit. It’s styled as a contemporary bistrot and you can watch the Chefs cooking through an opened kitchen. 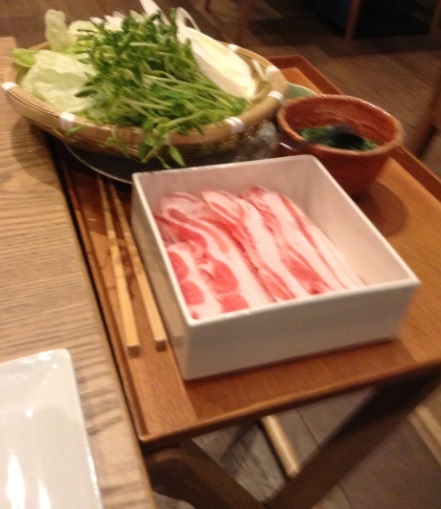 The Kagoshima pork shabu shabu I was having did not impress: I am not too sure about pork being an ideal choice for shabu shabu. It just tasted flat / ordinary during this meal. The broth was nothing to rave about neither: it lacked subtlety and tasted bland. There was a choice of a spicy and non spicy sauce in which to dip the pork. Those were properly made and tasted good, but dipping the pork in both sauces could not erase the souvenir of that average shabu shabu from my mind. In Montreal, a place like Shabu Shabu Kagayaki offers shabu shabu that I found far tastier. 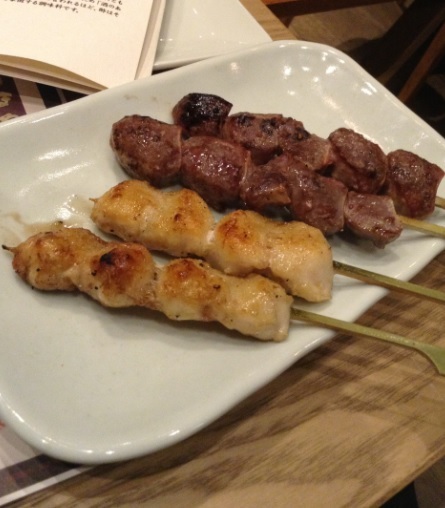 Rounded my meal with couple of yakitori /grilled chicken items: gizzard, liver, hip. They were decent enough (no dry meat, no over-seasoning, etc), but they lacked the exciting palatable dimension found at some other yakitoris (the other places had more exciting marinade, their meat more flavorful, etc) that I have tried in Tokyo. Verdict: 5.5/10 (Category: entry level shabu shabu) I need to try their other offerings in order to have a definitive opinion about the place. 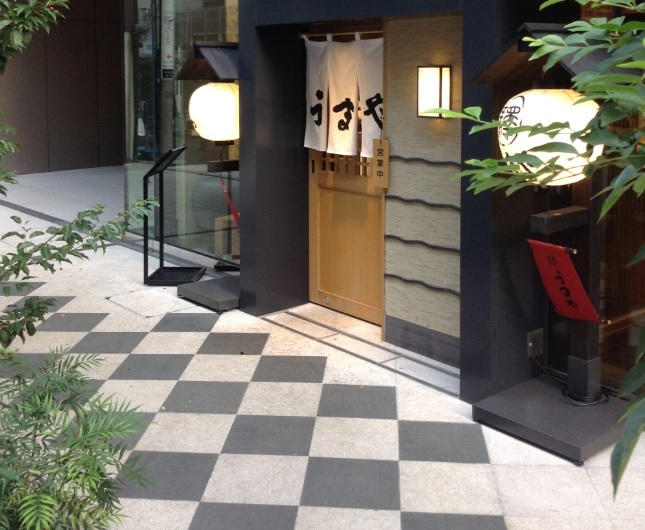 It’s a place I wished I could love as the service was superb and you can see that they try really hard to ensure that the experience is mesmerizing (for eg, the theater around the shabu shabu presentation is appreciated). 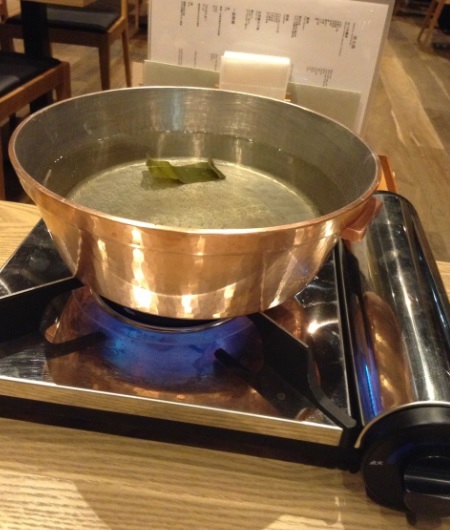 But food in general, shabu shabu in particular, needs to never fail at being delicious.